B2B marketing has changed dramatically during the last few years. Where selling to millennials was once more common (in the context of business to consumer [B2C] marketing), the younger generation has flipped this area of marketing on its head and become extremely influential in business to business (B2B) purchasing. So, what exactly does this all mean and, more to the point, how should marketers respond? Well, in short, this means that we are witnessing a generational shift in B2B buying that has taken place as a direct result of exposure to digital technology. Millennials (born between 1980 and 1993) have had a lifelong exposure to digital technology that has opened the gateway for them to take on different roles within the workplace and sets them apart from their generational colleagues of Baby Boomers (born 1954 – 1964) and Gen X’s (born 1965 – 1979) who haven’t had the same exposure. IBM: To Buy or Not to Buy? A number of recent studies, including IBM’s To Buy or Not to Buy, provide us with an in-depth insight into the preferences and practices of millennials. IBM’s survey was based on 704 individuals (Millennials, Gen X and Baby Boom) from businesses large and small and revealed significant differences between the generations’ buying techniques. The study revealed (as an example) that millennial and Gen X buyers are more likely to make decisions in isolation compared to Baby Boomers. It also showed that millennials want to interact with vendor representatives when researching products and services, far more so that Gen X or Baby Boom buyers. Other studies have revealed how millennials tend to favour digital technology and social media platforms such as Facebook and Youtube to research products and services before making purchasing decisions. The study carried out by marketing agency, Sacunas, looked at the buying habits of over 2,000 millennials across the United States. It found that millennials value authenticity and want direct interaction and communication with brand representatives. According to the Sacunas study, millennials are far more likely to use digital channels like search engines, vendor websites and social media to make purchasing decisions. 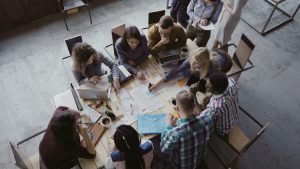 Research from IBM, Sacunas and other sources have also revealed that millennials prefer to do business with companies who have similar values and sensibilities. Online and offline communication is equally important and they crave a hassle-free, omni-channel client experience. With easier access to information and personnel, producing content that serves millennials’ needs and interests is a must. Tools and policies should be designed for their convenience and clients must be human and approachable in order to create a client and brand experience that is based on trust and integrity. Take advantage of the studies and reports out there to find out more about millennials, their practices and their preferences before making your marketing decisions. This entry was posted in Observations & Answers on September 1, 2017 by Roland.